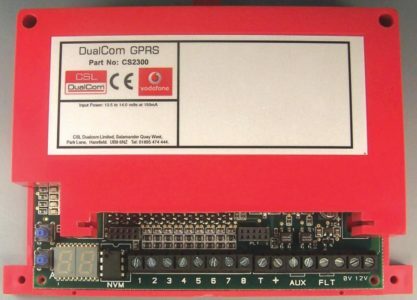 DualCom GPRS is an intruder alarm signalling device that uses both the Vodafone network and your telephone and/or IP path to transmit intruder, fire and personal attack signals at high speed. CSL DualCom has pioneered a single hardware platform which fits every grade of security risk, right the way from Grade 2, 3 and 4 Security installations to the highest specification of Fire signalling grades. The price of the product has been matched to the grade so that if you are installing for a Grade 2 specification you are not paying Grade 4 prices. DualCom’s unique GradeShift® technology means that the hardware platform remains unchanged so that there is one common product across all grades. Simply order the G2, G3, G4 or the Fire version dependent on the grade you require. CSL invented integrated dual signalling back in 1996 and has since led the way in ensuring that Intruder Alarm Systems have the best possible chance of getting a signal from the protected premises to the Alarm Receiving Centre. A dual signalling device helps to distinguish genuine from false alarms and can, therefore, prevent your Police response time from dropping to a lower level or being withdrawn. GPRS is a high-speed signalling technology used to send and receive ‘packets’ of data. CSL chose Vodafone for the integrity of its performance in both reliability and speed. DualCom is charged as a fixed tariff, meaning the device can send and receive an unlimited amount of data at no extra charge. This affordable new technology offers dual signalling at single-path signalling prices and is favoured by insurers and Police as the smart way forward in the protection of people and property. DualCom’s unique GradeShift® technology means that the hardware platform remains unchanged so that there is one common product across all grades. The grade category is selectable through remote programming via the Alarm Receiving Centre or the Alarm Installer, meaning that all grades are quick and easy to install. Simply order the G2, G3, G4 or the Fire version dependent on the grade you require. If for any reason your insurance specification increases or decreases there will be no need to install a new signalling unit – just contact your Alarm Receiving Centre or Installer and for a small charge, the installation will be up or downgraded. All the above features plus: Designed for lower risk premises usually domestic or small commercial installations, G2 offers an affordable dual signalling solution whilst providing future proofing against the planned changes to the BT Network (21CN – explained overleaf). It is also ideal for upgrading digital communicators which offer limited protection and one single path. All the above features plus: Designed for medium risk premises, DualCom G3 is ideal for larger commercial installations and is approved by all leading insurance companies for this grade of risk. It provides enhanced polling in the form of Priority Polling™ (explained overleaf) completely free of charge giving you extra peace of mind. DualCom G3 is future-proofed against BT’s planned changes to their network and its unique Gemini Callback® feature teamed with 21CN Mode® make it an ideal choice if you wish to eliminate unnecessary keyholder callouts. All the above features plus: Designed with the highest risk premises in mind and is the ultimate signalling solution for premium commercial installations. DualCom G4 is compliant with EN50131 Grade 4 (the most stringent of all security regulations) ensuring maximum insurance approval and loss protection. In addition to this, DualCom G4 is polled every 3 minutes on all signalling paths so that you will know of an intrusion at the earliest possible instance. Its 96-hour memory log (explained overleaf) provides an infallible record of on-board activity. Is available on all GPRS G3 products and can be switched on when stock profile is high or premises enter a higher category of Risk and require a higher degree of polling. For additional peace of mind all DualCom products will incorporate this unique Callback feature. If a DualCom fails a GPRS polling call, we will call the DualCom over the GSM path (at no extra cost) to verify that the DualCom is able to make a call before keyholders get disturbed unnecessarily. All DualCom products have a programmable 21CN-MODE™ whereby enhanced polling on the radio path will avoid unnecessary keyholder contact from telephone or IP path disruptions. 21CN-MODE™ can also be used to increase polling over Holiday or high-stock periods.